To find DRIPs and Direct Stock Plans, you should first look at large-cap stocks. The Dow is made up of large market cap stocks so you should start there. 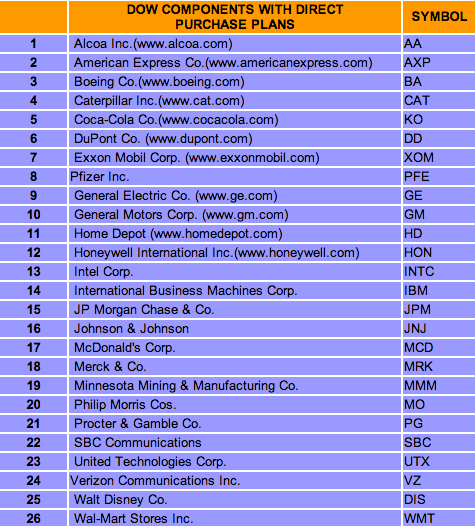 Nearly all the companies in the Dow (except for Citigroup, Hewlett-Packard, Microsoft, and American International Group) have some sort of Direct Purchase Plan -- either Direct Stock Plans or DRIPs. There are well over 1,400 companies with Direct Purchase Plans so your search for suitable companies should not end with The Dow. You may also want to look into the companies in The Teenvestor Index (www.teenvestor.com) or the S&P 500 (www.standardandpoors.com). Recall that the advantages of Direct Stock Plans and DRIPS include the fact that Teenvestors can (1) avoid big brokerage commissions by buying shares directly from companies, (2) invest small amounts regularly, and (3) buy fractions of shares. A handful of online brokers are now offering some of the same advantages as these plans and much more. Specifically, they (1) charge as little as $4 for each transaction, (2) require minimum investment balances as low as $20 for their list of eligible stocks (which range from 1,000 to 2,000 stocks), (3) allow investors to buy fractions of a share, and (4) keep records of transactions (which eliminates a big investment headache). Buyandhold and Sharebuilder are two of the most prominent of these types of online companies that provide the benefits of Direct Stock Plans and DRIPS without some of the hassles. Some of these online companies, however, require that they withdraw money for stock purchases directly from their customers' checking accounts. This could be a problem for many Teenvestors who can't maintain large enough balances in their checking accounts to justify keeping them open. We hope that your parents can help you come up with creative ways to solve this problem if you intend to use these low-cost online brokers.